“It’s not what you know, it’s who you know,” Rosie wisely stated during one of our Happy Hour conversations in De Big Fish bar. We looked admiringly and jealously at another cruising friend who had lined up a nice job on a big catamaran, providing some well-needed money to keep the sailing life going. 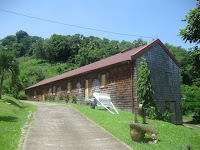 But, knowing the right person doesn’t only help to land you a job, it also comes in handy when wanting to see Grenada. And, in our case, the person to know was our friend Frik, aka Doc. 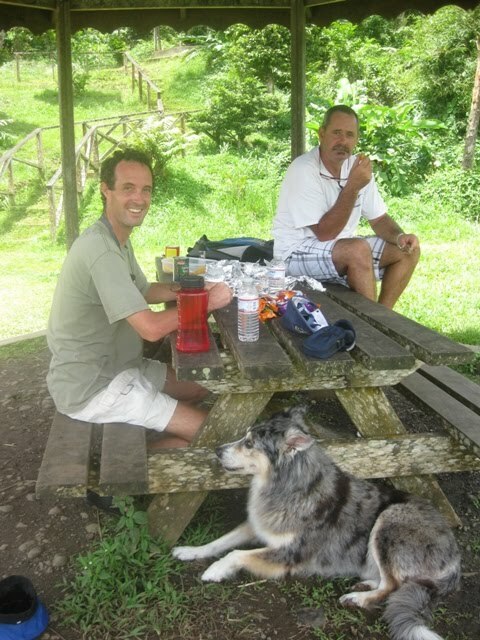 Mark, Darwin, Kali and I met Frik in Luperon, Dominican Republic over two years ago. We were all there sitting out the hurricane season and learned that Frik is a doctor from South Africa, always prepared to donate time in a local hospital or assist cruisers with medical issues. Since a year, our Doc has been teaching in the Medical School in Grenada, giving us plenty of opportunity to catch up on each other’s lives. 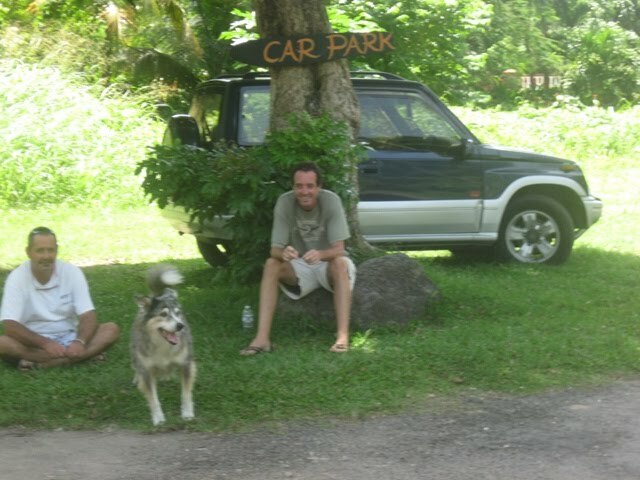 But, best of all: Frik has a car and knows Grenada in and out. After being here for over a month, we took him up on his offer to take us around. The summer is a great period for sightseeing in the Eastern Caribbean. The hurricane season keeps out the cruise ships and with it the mass tourism flooding all the sights. 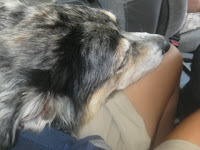 Mark, Darwin and I snuggly fit in Doc’s little Suzuki which labored hard to drive us up and over mountains, over gravel roads and towards many interesting places. It was Saturday and another hot and humid day, but we took the constant sweating with a smile, ignoring the lack of AC and proper ventilation and enjoying a special tour, without having to drive ourselves. Our first stop, Annandale Falls, is the tourist highlight of Grenada. Big was our surprise to find nobody there. Even though it was only 9 am, we quickly put on our bathing suits and jumped in the chilly water. 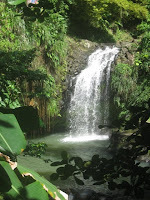 I showed Mark and Darwin how to swim behind the waterfall and then jump through it. Darwin trustfully followed and got soaked to the bone. 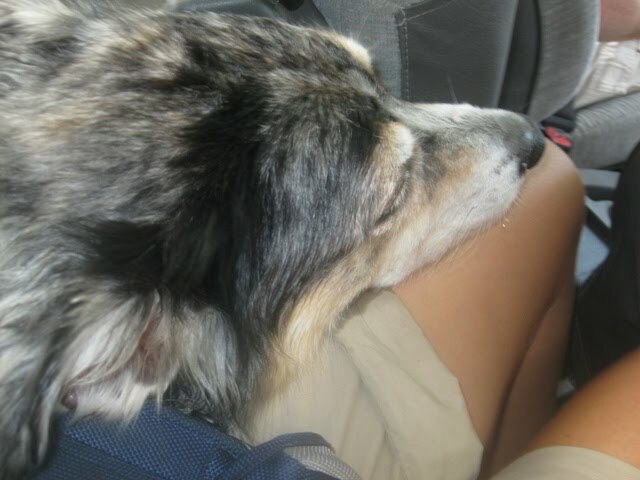 This was the perfect way to keep him cool for a couple of hours of driving. Mark took the safer route back and once out of the water, the air dried us in minutes. 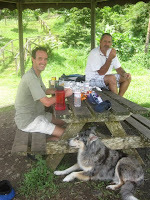 We passed the Botanical Gardens and arrived at Grand Etang Lake for an early, relaxed lunch. Just like last year, when I was here with my cousin Griet and her husband Wim, the peace and quiet fell over us. This crater lake is not at all very big, but its serenity makes one enjoy just sitting and listening to the surroundings. 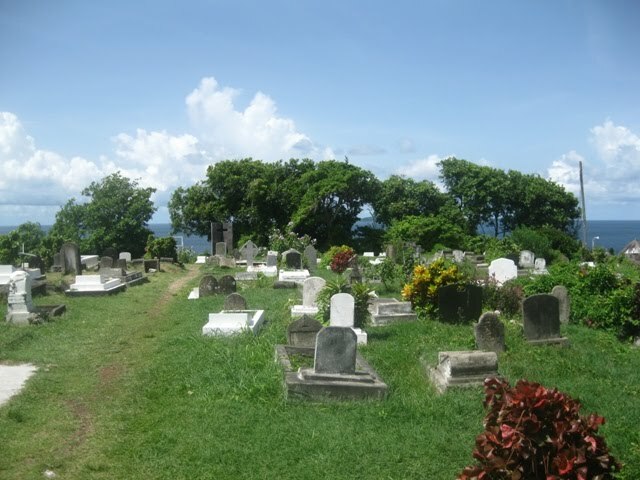 Since this spot is one of the highest in Grenada, the temperature is very pleasant without the overwhelming humidity found in the lower areas. We were in no hurry to leave and savored the moments of non-sweatiness. In the early afternoon, Frik drove us through Grenville, up the east coast towards the northern beaches. 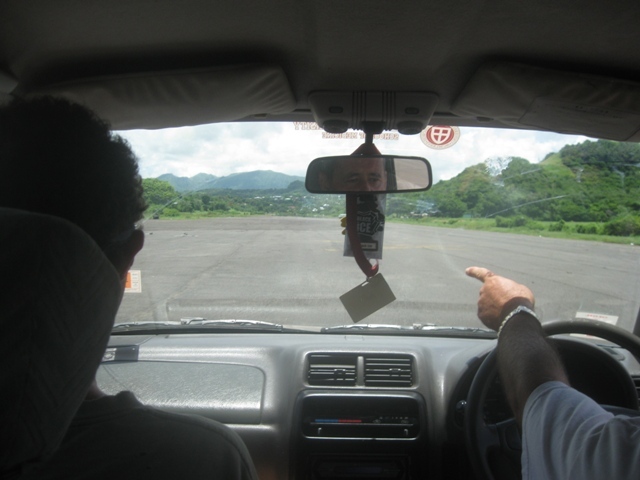 We had to try the runway of the old airport to see for ourselves whether we could actually take off. This area is now used for drag races and on the other side of the pavement, a little town erected since the airport sunk into disrepair. A quick stop at Belmont Estate revealed empty historical buildings and the sight of a chocolate factory on a non-working day. Because the complex is closed on Saturdays, I gave myself a quiet tour in the beating sun, pretending how Grenada’s famous organic chocolate is made. How do they keep it from melting before it reaches the stores? When I think about our difficulties keeping Belgian chocolate (which still beats the Grenadian version, by the way) up to taste, I wonder what the trick is. Mmmm, maybe it has to do with refrigeration? In our efforts to find Bathway Beach, we overshot it by a bit and ended up in Sauteurs, a town on the north coast. We used the opportunity to visit Leaper’s Hill and its cemetery. From this point, the last standing Carib Indians, the islands’ indigenous people, jumped to their deaths rather than be captured by their French defeaters. On this clear day, we could see Rhonde Island and as far as Carriacou and Union Island, over 30 miles away! Levera Beach is a local beach in the north, providing a picturesque view of the three lesser known islands Sugar Loaf, Green Island and Sandy Island. 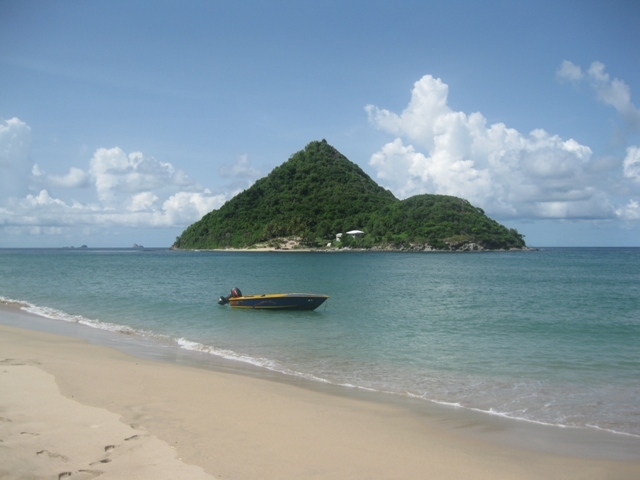 Sugar Loaf, just across the water, sports a single house and we fantasized how it would be to live in such a quiet, pristine place on your own little island. The difficulty of grocery shopping and Wirie sales came to mind and so our explorations continued with a short refreshment stop on Bathway Beach. The incoming waves are put to a halt here by off laying rocks creating a natural breakwater and in front of it a calm pool for bathers. Time was a tickin’ away and we had to make it back to the opposite corner of Grenada before nightfall. Via Sauteurs we cut through the island to the west coast again, getting stuck in the chaos of an organized walking tour (Hash House Harriers) after being sent there by some locals who thought that was where we were headed. Before returning to the St. George’s area, we had one more attraction to feel: Concord Falls. From the moment we turned off the main coastal road, the vegetation became lush and abundant again, surrounding us with ferns, fruit trees and bamboo. Walls of jungle and the absence of houses, made the trip along the narrow road more than worthwhile. At Concord Falls, we were still alone and nothing was more refreshing after a superhot day, then the jump into the fresh water pool. Especially Darwin was happy to be swimming and drinking at the same time, a rare treat. Being used to salt water, he had to struggle a bit harder than usual to stay afloat.